Amid this month’s news of regime advances near the Lebanese border, the stalemate in Aleppo, and rumours of a “final” fight for Homs, the story continues of the Syrian military’s effort to push insurgents out of key suburbs of Damascus. Opposition fighters have been inside areas like Qaboun, Barzeh, Jobar, and Eastern Ghouta for months, putting pressure on the capital if not threatening to move into it. The Syrian military has pursued a sustained campaign of shelling and airstrikes but, despite armoured ground assaults, has been unable to dislodge the insurgency. On Sunday, video highlighted an attack by the insurgency in Harasta, using Russian-made mortars, on the “scientific research facility” in nearby Barzeh, while other footage showed the aftermath of shelling and clashes with heavy machine gun fire inside the area. On Saturday, EA reported a large surface-to-surface missile attack on the Qaterji neighborhood in Aleppo, in which a mosque was destroyed. We now have reports from an activist in Aleppo who says that the death toll is much higher. We are following up on these claims and hope to have more details soon. This video purports to show Islamist faction Kataib Ansar As Sham using a Konkurs anti-tank weapon to take out a regime T72 tank. The video, uploaded on Monday, does not specify a time or a location, though the Kataib Ansar As Sham operates in and around Latakia. Videos posted on Monday show a peaceful demonstration in Azaz, north of Aleppo, against the interference of the Islamic State of Iraq and As Sham in the affairs of the town’s residents. This video purportedly shows insurgents in Raqqa capturing two tanks and a large number of weapons from a convoy of the Syrian Army’s 93rd Brigade on Sunday. Heavy shelling continues on Monday in the strategic northern Damascus neighborhoods of Barzeh and Qaboun. The regime is fighting for these neighborhoods because if it controls them it will control access from the northeast into Damascus. As fighting continues to rage in Syria, tens of thousands of people trying to flee the country are being refused entry into Iraq, Jordan and Turkey, rights group Human Rights Watch claimed on Monday. While Lebanon has an open border policy for Syrians fleeing the conflict, authorities in Jordan, Iraq and Turkey have closed the borders, allowing only limited numbers of Syrians to cross and leaving tens of thousands stranded in dangerous conditions. 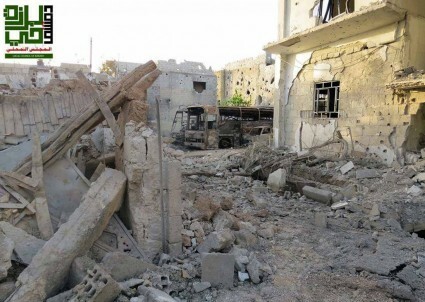 HRW say that seven people injured in an alleged regime airstrike on the Bab al-Salam camp for displaced Syrians near the Turkish border on June 25 were allowed into Turkey for treatment. However, thousands of Syrians remain in the camp, after Turkey refused them entry. According to HRW, Jordanian border guards are refusing entry to Palestinians, Iraqis, single military-aged men, and anyone without identity documents. Meanwhile, authorities in Iraq’s semi-autonomous Kurdistan Regional Government (KRG) admit that they closed their border with Syria in May 2013. Since mid-June only some Syrians in need of emergency humanitarian assistance have been allowed to cross. Regime officials have confirmed the insurgency’s claim that it shot down a helicopter near Nubl in Aleppo Province. Prime Minister Wael al-Halqi implicitly denied the helicopter was a military target, saying there were “educational cadres on board”. An official source said seven “civil employees”, as well as the crew, were killed. Fighting has been sustained about Nubl and nearby al-Zahraa, two of the towns controlled by the regime amid large areas of insurgent-held territory. The Governor of Homs Province, Ahmad Munir Mohammad, has refuted as “baseless” the reports and footage that indicate the Syrian army targeted the Khaled Ibn al-Walid Mosque in the Khalidiya section of Homs city. Amid heavy shelling of the area this weekend, video showed destruction after parts of the mosque were set on fire. Mohammad said “armed terrorist groups are infamous for such acts”, claiming that they had struck historic mosques in Aleppo and Daraa. He asserted that “the army is keen on protecting the religious and worshipping places as they belong to the human civilization”. The Local Coordination Committees claim 83 people were killed on Monday, including 15 in Aleppo Province, 14 in Idlib Province, and 12 in Damascus and its suburbs. The Violations Documentation Center reports that 65,082 people have been slain since the start of the conflict in March 2011, an increase of 88 since Sunday. Of these, 49,863 were civilians, a rise of 42 from yesterday.